Tarkarli is a village in Malvan Taluka in the Sindhudurg district. 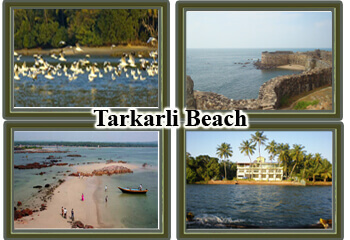 Tarkali tourism Includes an attractive beach . Tarkarli village is famous for Ramnavmi festival.the total distance from Pune to Tarkarli is 388 it takes 6 hrs to reach by road in between we can find number of petrol pumps and many restaurants where we can make ourself comfortable. There are number of places to see in tarkarli those are Tarkarli beaches, Tarkarli Sightseeing.The Dandi Beach which is located to the north of Tarkarli from where tourists are taken to the Diving site near the Sindhudurg fort, the chivla beach which is close to the Malvan rock gardens. Tsumani island - tarkarli is rising for the destination of Water sports with all major water rides including parasailing in the sea. The best route from Pune to tarkarli is starting from Pune -Satara-Kolhapur-Kasal-Malvan and finally Tarkarli . Malvan is also a beach destination with a long castline , the Chivla beach is the closest one near Tarkali town. Malvan has a distinct way of preparing food and this food has an amazing flavour. There are some intresting islands off the coast from Malvan. The Nivati rocks is one of the beautiful rocky island hear the lighthouse island and burnt island are famous for bird watching. The malvan rock garden is a beautiful manicured garden located just behind the malvan Police Station. There are many beach Hotels and resorts to stay around. The Devbaug Sangam near tarkarli is the most attractive spot where the karli backwaters meets the sea. Opposite to the banks of karli river there is Bhogwe beach with a few rocky patches. Other places to visit are Mahapurush Temple, Vittal Temple, Boating Point & water sports in karli river. Also there are adventure sports like Snorkeling to see corals and fishes , White Water rafting ,and Boating . You can hire an entire boat which costs around 1800/- it will take you for dolphin seeing.